The “Nancy” panel that went viral. Photo: Cartoon Strips Nancy © 2018. Courtesy of Andrews McMeel syndication for USF. On a Sunday afternoon in September, Olivia Jaimes was hiding in a storage closet at the Columbus Metropolitan Library in Columbus, Ohio. She’d been in there for two hours, watching episodes of The Good Place on her laptop and dressed like a chic fugitive — sunglasses, hair beneath a hoodie, face obscured by a scarf. In a few minutes, she would emerge to greet a crowd of admirers as the closing act of the Cartoon Crossroads Columbus comic convention, her first and only public appearance to date. The library wasn’t really built for staged events, though, so the musty closet was the closest thing to a greenroom where a reclusive headliner could take shelter. It was filled with stuffed animals and puppets for the children’s section of the library, and an idea occurred to Jaimes: “I’m like, What if I go out and only talk through a puppet?” she recalls. She didn’t go with the puppet, but if she had, it would have been consistent with her persona. Central to the growing interest in Jaimes’s nascent career as the new cartoonist behind the long-running newspaper comic strip “Nancy” is her commitment to personal mystery. To start with, “Olivia Jaimes” is a pseudonym. The public knows nothing about her life or background. On the rare occasions when she gives interviews, they’re almost always via email; otherwise, as in the case of one radio appearance and one brief YouTube interview, she has demanded that her voice be distorted. If you do manage to arrange a phone chat, the device she’s calling from obscures her number. She even refuses to answer questions about her pseudonymity. Luckily, though, her savvily modern and surprisingly funny take on “Nancy” speaks for itself. Almost immediately after she took over the strip in April — becoming the first woman to helm it in its 80-year history — her work became a sensation among comics fans. As the geek-culture website the Beat accurately put it in a headline: “This New Nancy Strip Is Lit — and It’s Got People on the Internet Going Crazy.” The fact that nobody knew who was making it only made it more of an object of fascination. Jaimes’s most famous work so far isn’t even a full story; it’s a single panel. On Labor Day, she published a strip in which the author jokingly announced she was taking the day off and offered, instead of the usual programming, a preview of installments to come. 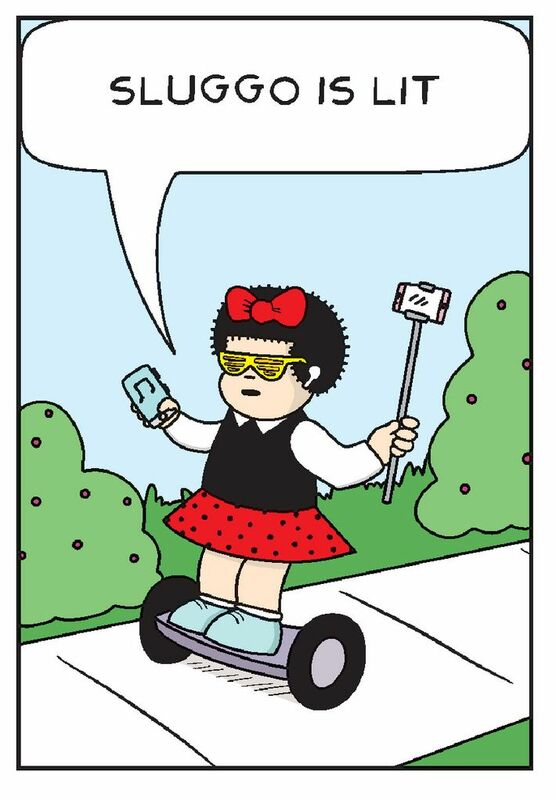 The second panel, intended as a response to negative comments she’d received for her modernizing efforts, depicted Nancy wearing Kanye West sunglasses, riding a hoverboard, holding a selfie stick in one hand and a smartphone in the other, and uttering the words “Sluggo is lit.” The image went viral, even spawning SLUGGO IS LIT T-shirts. And yet the strip’s creator remained elusive. Jaimes’s request fits with the puckish spirit of the strip, which originated with venerated Bronx cartoonist Ernie Bushmiller. It began as an offshoot of a flapper-mocking comic of the 1920s called “Fritzi Ritz,” which Bushmiller didn’t create but took over in 1925. In 1933, he gave the titular airhead an obstinate niece with a spiked proto-’fro who, Steve Urkel–like, gradually became the more important character, and in 1938, the strip was renamed “Nancy.” As the decades wore on, Bushmiller honed a superhuman ability for economical art and joke construction. He died in his art studio at the age of 76 in 1982, preparing to draw his next strip. In the years that followed, a succession of cartoonists took over, but none could recapture the glory of Bushmiller in his prime. From 1995 until this year, “Nancy” was helmed by Guy Gilchrist, who took it in an increasingly schmaltzy and sexualized direction, making Aunt Fritzi disturbingly buxom and Nancy into a kind angel and regularly inserting tributes to dead country singers. The Nancy I know and love is a total jerk and also gluttonous and also has big feelings. Glynn happened to follow Jaimes on social media, where she posts under a different name — he won’t say what that name is, of course, or how he came to follow her — and saw her posting about how much she loved Bushmiller’s work. She had a web comic of her own — again, Glynn won’t divulge what it is — and he had an editor reach out to see if she’d try her hand at “Nancy.” Jaimes sent two weeks’ worth of test strips, Glynn was blown away, and she was swiftly hired. Her first published strip was a shot across the bow to fans of Gilchrist’s cherubic Nancy. In the first panel, an adult says, “That Nancy, she’s such a sweet girl.” In the next, we see the adult watching Nancy put salt on a slice of pie. “Also a salt girl,” the adult says. Then Nancy prepares to eat a stick of butter. “And she doesn’t shy away from that butter either,” the adult notes. Cramming jokes like this into just a few panels seven times a week requires a technical precision some readers are likely to miss if they’re in it only for the punch lines, as Jaimes told the audience in Columbus after she finally emerged from the closet. “She said drawing ‘Nancy’ was like doing sudoku,” recalls Sikoryak. The event went off without a hitch, Jaimes’s identity remained undisclosed, and soon she was back to drawing new strips on her iPad. On the phone with Jaimes, I posit that her Nancy is perfectly suited to our present moment of cynical hedonism. The character is focused solely on self-satisfaction and stubbornly opposed to anything that gets in her way, and the strip allows readers to see themselves in her tech-addled narcissism and have a laugh at their own expense. Nancy runs in newspapers nationwide and online at gocomics.com.